Chavez is stripping down the country so that he can rebuild it the way he sees fit which will not be much. Just like a new recuit at boot camp. How military and he has been doing this since the start. It's the only training he has ever had. Its all he knows. Simple minded but effective with simple minds. Another example of making good use of this disaster is to finally create an apartheid system where only the faithful to Chavez will have access to ration cards for cheap food at Mercal, PDVAL and the like. Daniel, FYI, this is already happening. I have been told that families affected by the recent floods have been issued something called "la tarjeta del buen vivir" from Banco de Venezuela (oh the irony of the name...). Every month 1223.90 are paid into such accounts, and the cards (1 x family) can only be used in Mercal and Bicentenario. Thank you for not getting tired to report about this rotten haunted house that is Economic Policy rojo rojito. It did cease to amaze me. They are just not getting tired to dig up new holes to let the productive forces of your country stumble into. I wish you good luck. Guess you will need it. And its not your fault. Daniel´s loss is my gain, although I don´t say this with pride, since it will be cheaper to buy them next time I need to do so. For any Chavez apologist who claims that US networks are as biased as the state owned media in Vzla, I was watching a show on VTV the other day about new hospital technology that showed the random patient thanking Chavez for the equipment. Such shameless propoganda wouldn´t even make in on any US network. I don´t remember a random interview ever thanking Bush on Fox News for some product. After this CURRENT private sector disappeared and the economy collapsed, Chavez will later reopen the market again and allow a NEW private sector to growth. However this NEW private sector are controlled by his gang members. Hola dear riends: I am a Policeman in Maracaibo. There is many of us in Police and other work in Government that not corrupted. We cannot talk, other wise our life is in danger and the life of our Families and Friends. I have to secret everything I believe in what not supports President H. Chavez and his peoples. 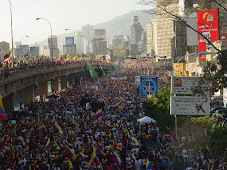 We do not want to leave Venezuela! This is our land that we love and are proud defending from chaos of the Presidente. Life is sad now in our land and getting badder every day. Many venezuelans are leaving, that is not good, it will not repair politics. We must stand together and fight for peace, freedom from tyranny and keep up hopes for better future. We can not do it alone; we are needing your help and that of all venezuelans in other countrys. If all you can do, please pray for us. Many wishes for you Daniel to have a good 2011 and wish it will be happy and calm. Signed C.R. Note: I send this via my cousin in Canada who knows who I am. Please do not blame it on the foreigners like the Russian, Chinese, ...or even Cuban. Blame it on Thugo Chavez who is selling Venezuela to the foreigners for his own greed. If Thugo does not want to sell then no foreigners can buy. Think of this in a more positive light. Your $ 100 bills just doubled in value. Venezuela is on the fast track to hell.